My hair is my favourite second and third day of not washing it. The second day I don't need to use dry shampoo, however my favourite way to style it is, if I straighten it I like to sleep on it wake up and have straight hair like normal. I might still keep it straight the second day, but if I go for a third day my favourite thing is to throw a little dry shampoo on and curl the ends with either a 1 and 1/4 or 1 and 3/4 inch curling iron on the ends which makes a really nice wave. Here's another picture. 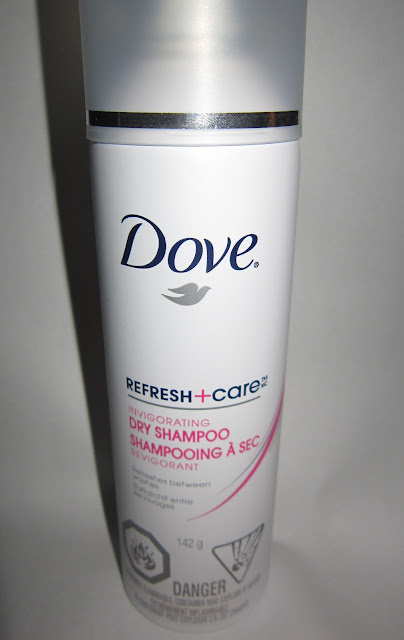 My hair is not the healthiest so I try to avoid washing all that often, now I've tried a few dry shampoo's, but so far my favourite is the Dove Refresh + Care "Invigorating Dry Shampoo." I bought this because it was on sale for $2.99 with the rest of the Dove products that week at Shoppers without hearing anything about it. So when I decided to use it I really enjoyed the smell. I'd like to say I did this for "science" haha but really I'm just extremely lazy. I didn't wash my hair for FIVE days. For me that is quite sometime but this stuff just works. My hair looked normal there was no grease and it didn't look flat either. It really does just refresh your hair and although most of the reviews on makeupalley.com are negative, I had a positive experience with it and wanted to share. I've had it for about a month now and there is still plenty of product. The product does come out white, so you do have to brush it through but that's just a thing you have to deal with if you have dark hair. I do spray it like normal people when I wake up in the morning to style my hair. But another way I like to use this and all dry shampoos for that matter is to spray it directly on where my hair typically gets oily the night before until its pretty much white. I then go to bed and if its still there brush it through and go on. I really like this technique and saves the fear of not being able to get rid of the white cast that may happen in the morning. Tell me in the comments your experience with this if you've tried it or what is your favourite dry shampoo?